NeoRio is an annual outdoor, contemporary art event. It is a call to the public to come and explore the results of artists, scholars, local experts and youth investigating and creating new works on natural world themes. The event takes place outdoors at Wild Rivers, in the Rio Grande del Norte National Monument. Created as a platform for innovative artists, NeoRio provides opportunities for cross-pollination between artists, scholars in other fields, conservationists, and members of the public and local communities interested in protecting and celebrating our wild lands and waters. Hosted by the Bureau of Land Management’s Taos Field Office, NeoRio is organized by us, LEAP (Land, Experience and Art of Place), in collaboration with other organizations and volunteers. Make a tax-deductible donation to support NeoRio! At NeoRio 2018 artists and collaborators will delve into the theme of “Roots ~ Raices,” exploring various angles –botanical, cultural, metaphorical and beyond. Come discover art installations along the rim of the Rio Grande gorge, related hands-on activities, the afternoon music and poetry salon, a delicious, locally-sourced, northern NM fall feast, artist talks, music around an evening campfire and More…. NeoRio 2017 celebrates glorious & fascinating seeds; they will inspire art installations on the rim of the gorge, by Kaitlin Bryson, Hollis Moore & Geraint Smith. Enjoy hands-on activities, a northern NM fall feast, artist talks, live music, & poetry, all reflecting this year’s generative, life-giving theme. More…. NeoRio 2016 features pollination-themed installations on the rim of the gorge by Lee Lee, Viviane Le Courtois and Jenny Lynn McNutt. Enjoy a locally-sourced Fall Feast, artist talks, music and poetry, all reflecting this year’s theme. More…. NeoRio 2015 will feature work by light artist, Ethan Jackson and an art-filled evening celebration on the rim of the gorge. Enjoy a locally-sourced, and inspired Fall Feast, artist talk and music, all solar-powered. This is a Questa “Luz es Vida” event, part of UNESCO’s “International Year of Light.” More…. NeoRio 2014 features the “‘T’ House” by Team Biocultura, Andrea Polli and John Donalds was well as an evening celebration with the “The Rio Feast Project” by Ric Lum. This year NeoRio also launches LEAP’s online Wilderness Thinkers Project, marking the 50th anniversary of the Wilderness Act. More…. 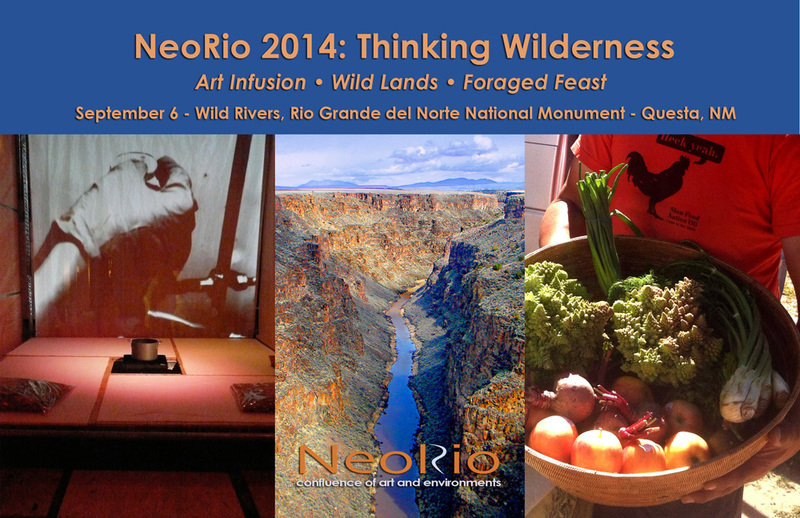 NeoRio 2013 features “The Ice Cream Olympics,” a July – Sept. residency in the new Rio Grande Del Norte National Monument. Anita Mckeown, collaborators and participants playfully explore local foods in celebration of the new monument culminating in “The Ice Cream Olympics” on Sept. 28. More…. For more information or to become a NeoRio sponsor or volunteer contact emailforleap@gmail.com or 575-224-9066. Interested in becoming a NeoRio Featured Artist? Click HERE for submission guidelines. NeoRio: Confluence of Art and Environments from LEAP on Vimeo.